The answer to the title of this post is that China is using the same model of development to develop other countries that it used to develop itself. And China is a shining example of why its own model works. 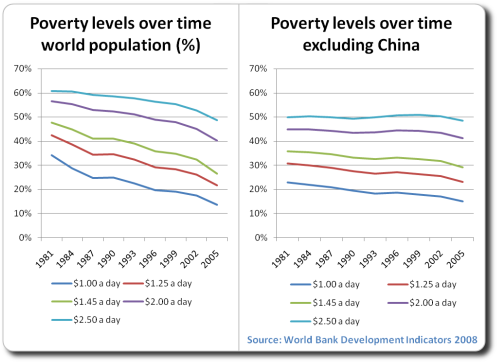 China has lifted hundreds of millions of its own people out of poverty and grown to be the second-largest economy in the world. Its growth in GDP is only matched by its increasing global influence around the world – an alternative superpower to deal with. Every day, on my drive on the highway from Accra to the Eastern region, I see the bridges and roads being built. Caterpillar trucks and big crews of Ghanaian construction workers being supervised by a Chinese foreman in a floppy hat. I have heard and read about China in Africa, and its strategic interest in the continent from a natural resource perspective. I knew they were involved in infrastructure projects, but I didn’t think it would be every single project. Probably the greatest challenge resides in the U.S. and the Western world. That challenge is to change the perception of Africa and encourage young entrepreneurs and investors to look at Africa as a place to do business. Business is probably a better way out of poverty than philanthropy. And I can’t wait for Business Schools to lead the way by developing curriculums on business in Africa. I agree, but there are two things I want to unpack about this statement. First of all, too often philanthropy and business are presented as mutual exclusion entities, which can be dangerous. There is a place for philanthropy in assisting marginalized populations. NGOs are doing good things in the realm of malaria, HIV/AIDS, tuberculosis, and other diseases that disproportionately affect the poor. Developing the infrastructure of a country is going to create a rising tide, to be sure, but philanthropy can be a strategic complement to ensure that the poorest do not become casualties of globalization. The first prong of Beijing’s efforts is to offer African states resource-backed development loans, an initiative inspired by its experience at home. In the late 1970s, eager for modern technology and infrastructure but with almost no foreign exchange, China leveraged its natural resources — ample supplies of oil, coal, and other minerals — to attract a market-rate $10 billion loan from Japan. China was to get new infrastructure and technology from Japan and repay it with shipments of oil and coal. In 1980, Japan began to finance six major railway, port, and hydropower projects, the first of many projects that used Japanese firms to help build China’s transport corridors, coal mines, and power grids. Since 2004, China has concluded similar deals in at least seven resource-rich countries in Africa, for a total of nearly $14 billion. Reconstruction in war-battered Angola, for example, has been helped by three oil-backed loans from Beijing, under which Chinese companies have built roads, railways, hospitals, schools, and water systems. Nigeria took out two similar loans to finance projects that use gas to generate electricity. Chinese teams are building one hydropower project in the Republic of the Congo (to be repaid in oil) and another in Ghana (to be repaid in cocoa beans). So far, most of these loans have been issued by China’s export credit agency, the Export-Import Bank of China (China Eximbank). Offered at market rates, they do not qualify as official foreign aid but nonetheless can help development. In poor, resource-rich countries, which are often cursed rather than blessed by their mineral wealth, resource-backed infrastructure loans can act as an “agency of restraint” and ensure that at least some of these countries’ natural-resource wealth is spent on development investments. In its second major experiment, China is helping to build special trade and economic cooperation zones in Africa. Seven such zones are in the works: two in Nigeria; the others in Egypt, Ethiopia, Mauritius, Zambia, and, possibly, Algeria. Special economic zones were an important feature of China’s early development; today, China has more than one hundred such areas. The economists Paul Collier, author of The Bottom Billion, and John Page, of the Brookings Institution, argue in a recent report for the United Nations Industrial Development Organization that special economic zones can be a very promising strategy for industrialization and employment in Africa’s least developed countries. It allows countries to improve poor infrastructure, inadequate services, and weak institutions by focusing efforts on a limited geographical area. And a targeted focus on boosting manufactured exports can help countries overcome the exchange-rate appreciation and the weakening of local non-energy industries that often accompany natural-resource exports. By the time business schools in the U.S. start offering curricula on Africa, the Chinese will be way ahead, as they are right now. In fact, China just opened the first campus of the China Europe International Business School (CEIBS) – one of the top 30 schools in the world – here in Accra. The next generation of business leaders in Ghana will train at a Chinese business school, not one in the U.S. It is rare that the United States is not ahead of the curve in terms of identifying market opportunities and developing innovative solutions to problems. But, in the case of business in Africa, I’m afraid China has got the upper hand. While the West supports microfinance for the poor in Africa, China is setting up a $5 billion equity fund to foster investment there. The West advocates trade liberalization to open African markets; China constructs special economic zones to draw Chinese firms to the continent. Westerners support government and democracy; the Chinese build roads and dams. In so doing, China may wind up supporting some dictatorial and corrupt regimes, but — and this is an inconvenient truth — the West also supports such regimes when it advances its interests. And given the limits of the West’s success in promoting development in Africa so far, perhaps Westerners should be less judgmental and more open-minded in assessing China’s initiatives there. Microfinance is taking some real hits lately. For a few years now, researchers have questioned the efficacy of microfinance in getting the poor out of poverty. Then there were criticisms that the field was losing its soul as it chased profit motives, and recently the debacle in India. Your blog started out championing the field. But lately, including in this post, you seem more reserved about its impact. I wonder what your thoughts are for the future of microfinance. Like Jazzercise and wine coolers, has this great experiment of the 80s outlived it’s usefulness?